A common issue matched bettors have is continuing to make a profit after they have completed the new customer offers. A lot of people quit saying there is not enough money to be made with reload offers and other bookmaker promotions. Rubbish! There is multiple-times more profit to be made AFTER you have completed the new customer offers and in this article we’re going to break it down to show you where it is. Everybody has different goals with matched betting. For some it’s a way to pay for the shopping each week, beer money for weekends or to pay for Christmas or a family holiday. Others just want to make a quick, one-off £1,000 from the new customer offers. However, some matched bettors make £1,000+ every single month and can afford things they never would have been able to without matched betting. So how do they do it? Lets break it down into daily profit. So to make £1,000 a month you will have to profit £32.87 each day from matched betting. Now that it’s been broken down it doesn’t seem so unachievable does it? Now lets take a look at how we are going to make that £32.87! I’ve been using MatchedBets.com a lot recently and they have a ‘Daily Offers Calendar’ which lists all profitable offers from a load of bookmakers . If you were to trawl the web looking for offers at every bookmaker it would take you all day. Thankfully, their team does this job and instructs you on how to make a profit from them. Taking a look at today’s offers, there is a guaranteed profit of £39 to be made. Great! That’s our target surpassed today already! However, some of these offers may not be repeatable and so tomorrow we might have less to choose from. Also, Wimbledon is on at the time of writing this post and so there are a few more bookmaker offers about than usual. Lets say on average we make £15 from the daily offers. From experience and checking the offer calendar daily, I know this is about right. Not a bad start but we have a bit more to go until we reach our target of £1,000 a month. Over the past year or so, accumulator offers have been a great source of income for matched bettors. The development of accumulator tools such as MatchedBets’ ‘AaccaBackers’, Profit Accumulators ‘Acca Catcher’ and OddsMonkey’s ‘AccaFinder’ make finding the most profitable accumulators a breeze. Tie this in with a bit of matched betting maths and you have yourself a guaranteed profit! What are accumulator refund offers? The rules for acca insurance offers are generally the same and usually consist of a refund as a free bet if one leg of your accumulator lets you down. How do you guarantee a profit from acca insurance offers? Lay at the start – You lay all of the games in your accumulator before they have kicked off. This can result in a small qualifying loss if more than one of your matches loses and you don’t qualify for the refund. However, on average, you will make a profit with this method. Lay Sequentially – You lay each game as they come. You lay normally until one leg loses and then lay a reduced stake until a second leg loses and so on. This method sees that your qualifying loss is minimal but it does require you to be available to lay the different matches at various times. No Lay – This method will return the highest profit if it comes in but it is risky. You are banking on either your acca winning or one leg losing so that you receive the refund. The aim is to pick an acca with the lowest cumulative odds so that you have the best chance of it coming in. Guaranteed Profit Method – You will make a profit from every acca with this method but your profits will be lower than when using the methods above. Similar to the ‘lay sequentially’ method, you lay your matches until one loses and then lay at a new calculated stake for each game after. It may sound confusing but the acca tools do all of the work for you and tell you how much to lay for each leg of your acca. To ensure a profit, use the guaranteed method. So how much can you make from accumulators? Multiple bookmakers now offer accumulator refund offers. MatchedBets.com currently has 10 different bookmakers integrated into their AccaBackers tool which gives users a lot of opportunity to make a daily profit. Most acca insurance offers can be done once per day but some bookies such as Coral and Paddy Power allow customers to claim the refund multiple times a day. Realistically though, most people won’t be doing more than one ACCA a day unless you have a very large bank. The average value for an acca insurance offer is around £11.30, so lets add this to our daily total. We’re nearly at our target already and have a bit more to cover! Happy days! There are a few bookmakers now who offer ‘loyalty schemes’ or ‘free bet clubs’ for their customers. It’s great for them as customers keep betting and it’s great for us as we get free bets every week! They usually require you to place a number of bets of a required amount each week to receive a free bet in the region of £5 – £10. This isn’t huge but if you qualify for a few of these offers then it all adds up. Above are just a few loyalty bet offers from the big names but there are quite a few others out there which will return a profit. Lets say you qualify for £20 of these. If you cash in 80% of the free bet value you will pocket £16 a week, which works out at around £2.85 per day. If you’ve been through all of the signup offers then you will most likely receive emails from the bookmakers and casinos every now and again offering you free chips or free spins. This happens surprisingly often and usually when a new slot game is released and they want to promote it. Although these offers are pretty low value, they can still return a profit. There’s also the chance that you’ll hit a big win of hundreds or thousands of pounds. Take a look at the screenshots below of a couple of lucky guys who hit the jackpots when completing some casino offers. As these are pretty low value, we’ll say that it adds another £0.50 to your daily profit. Now that we’ve covered the guaranteed profit offers, lets take a look at the multitude of offers that are +EV. EV stands for ‘Expected Value’ and is what you can ‘expect’ to make from the bet on average over time. You will not make this amount every time you complete the offer but over time you will see an overall profit. An example is how casinos make money. The casino has an edge on all games. Take roulette for example, which has a house edge of around 2.5%. This means that the casino will, on average, profit £2.50 from every £100 bet on the table. However, this won’t happen every time. You could place 10 bets on red and they all come in. However, over time, the casino will profit around 2.5% of bets. The same goes for +EV bets. You won’t profit on them all. You’ll go through winning and losing streaks. But you will make a profit the more you do them. Although the above offers will not guarantee a profit, they are worth doing if you are serious about matched betting and maximising your profits. A lot of them can return high profits for a very small qualifying loss. These offers can be worth hundreds or even thousands of pounds each month. However, as you may not have a big enough bank to complete them all, we’ll say that you complete one of these offers per day. This should equate to around £10 per day. If you are determined to make over £1,000 a month with matched betting, there are a few tips you can take into consideration which will help. Look at what offers are available for tomorrow or the next day. Don’t leave everything until the last minute as it can take time to prepare your bets for the day and to make sure you have the correct bets on. Some matches may start early and will be a missed opportunity if you don’t find out about them until after they’ve started. The daily offers calendar at MatchedBets.com displays offers for the full week ahead. It’s a great tool for planning your weeks matched betting. It’s tempting to withdraw funds once you’ve made a profit but it is advisable, when possible, to keep your bookmaker accounts funded. You may need a bigger than normal bank for some offers and it is a lot easier if the funds are already in your account. Completing the new customer offers is a great way to fund your monthly matched betting process. Most people withdraw their profits and spend them on luxuries. However, these profits will help you earn even more profits in the months to come. If you don’t have a good sized bank, you won’t be able to get to the £1k a month milestone. It is important to keep track of your matched betting profits and bets. Firstly to know where your money is and secondly to give you motivation to keep making money! A lot of the top matched betting sites have profit trackers now. MatchedBets.com also saves all of your bets and stakes so you can go back and check what offers you’ve completed and what you’ve bet on. In order to make a consistent profit with matched betting, you need to keep your bookmaker accounts open and unrestricted. This means staying under the radar with your matched betting activity. 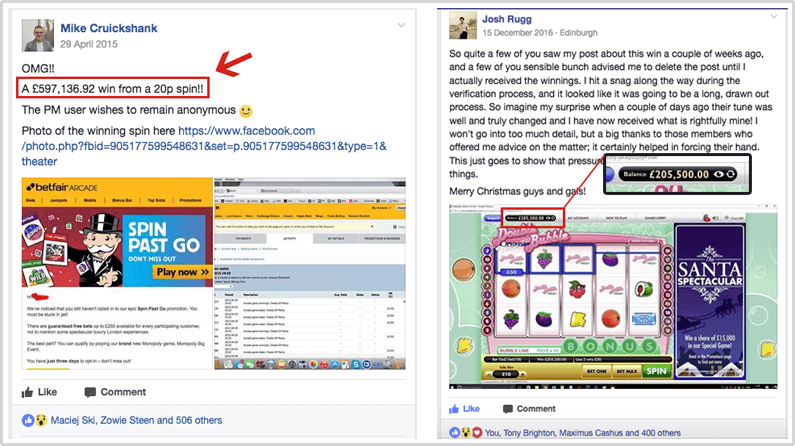 It’s no secret that bookmakers don’t like you matched betting so you have to act like a regular punter which means placing the odd ‘mug bet’ every now and again. If you don’t, you could see your account ‘gubbed’. We go into mug betting and being gubbed in a bit more detail and why it’s important in our ‘What is Gubbing?‘ article. 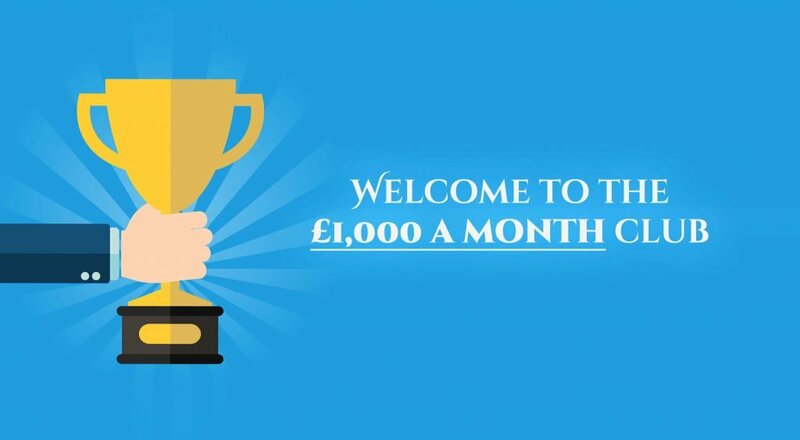 Have you joined the £1,000 a month club? Do you aim to get there? Or maybe you have some tips for other on additional ways to boost your profits each month. Let us know in the comments below. Along with the methods listed above, there are some good long-term offers. Paddy & Bet365 do the 2-up offer which has been my biggest earner so far this season. I’ve made around £4k from it. William Hills High 5 is also another good one. £1,000 is very achievable. You just have to learn what the best offers are. Most people give up when they can’t make their profits from ‘bet & get’ offers anymore.